Welcome to the Flynn & Dagnoli website. 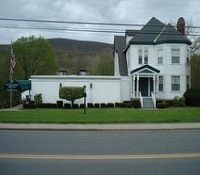 We are a family-owned funeral home with three locations serving the Berkshire County communities of Pittsfield, North Adams, Williamstown, and Adams; their surrounding towns; and Southern Vermont since 1928. Our staff is committed to providing the highest level of service to families experiencing the loss of a loved one. We hope this website can further assist you and help us extend our service to you. We can always be reached at 413-663-6523 or 413-442-1733 for immediate service.